In this article, we will compare and review 12 of the best bidet toilet seats. We have spent several hours combing through all of the options to find t﻿﻿he best of the bunch﻿﻿.﻿﻿ There’s something for everyone in our chosen selection – read on to find out which bidet toilet seat would be the best one for you. Bidet toilet seats, also known as washlets, are an innovative idea that brings you the best of bidet technology without having to have an actual bidet. They are the ideal solution for anyone who wants the gentle cleansing of a bidet but doesn’t have the room for full size bidet – or maybe just doesn’t like the idea of using up bathroom space for one. A bidet toilet seat replaces your standard toilet seat, allowing your toilet to act as a bidet and toilet in one. They look very similar to a standard toilet seat and won’t make your toilet look ugly or bulky. They will seamlessly blend into your bathroom, bringing you the luxury experience of true cleanliness. Below you will find a quick reference guide that highlights some of the differences between the bidet toilet seats we have chosen as our top twelve picks. The table is ideal for a quick browse to select your favourite options before delving into the individual reviews. We will now discuss each of our top picks in a little more details so you have a fuller understanding of what each model offers. The Toto SW2034-01 Elongated C100 Washlet is our favourite of all of the options. The number one best seller on major shopping sites, this model is one of the cheaper models we have chosen, but it performs along with the most expensive. This model features a front and rear jet for washing. It can be adjusted to three different temperatures and five different pressure settings, so it can suit more than one person’s preferences. There’s also an option for an oscillating flow. The seat is heated for your comfort, and the warm air dryer has three settings too. This model automatically releases a pre mist coating to prevent anything sticking to the bowl, and also produces an air deodorizer to prevent any lasting odours. The seat is easy to remove for cleaning, and the jets are self cleaning, being cleaned before and after each use. The Toto SW2034-01 Elongated C100 Washlet is the ideal choice for anyone who wants the best of the best, with all of the features, without breaking the bank. 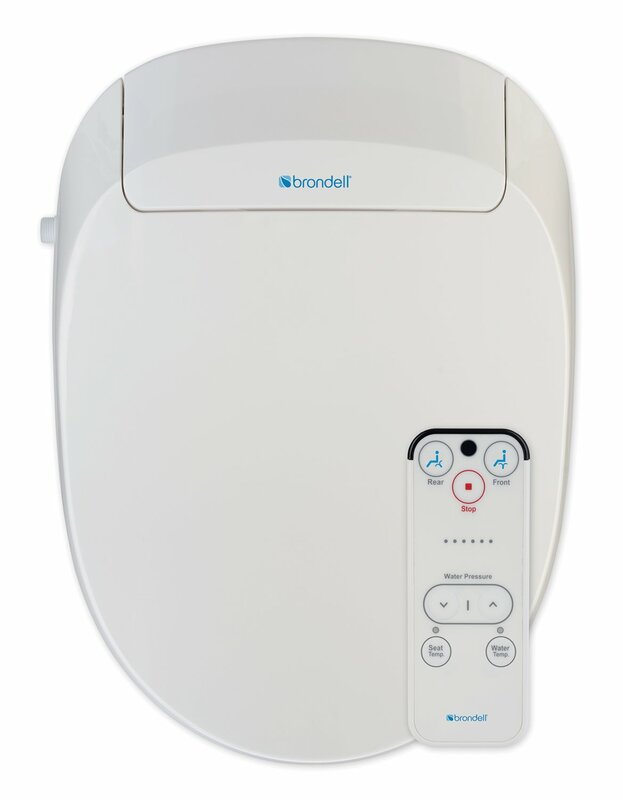 The Brondell Inc. S300-EW Swash 300 Washlet is one of two of the cheapest models on our list. This elongated washlet comes with a remote control for your convenience. The remote control is wireless. It can be used to control the water and seat temperature settings and the water pressure of the aerated water jet. This model has dual water jets, ensuring a full cleanse of the back and front. These jets are self cleaning, saving you some time and effort. This model can be easily installed in less than an hour and doesn’t require a tradesman. It even comes with a special eco mode that will help you to save energy and therefore money when the seat is not in use. The Brondell Inc. S300-EW Swash 300 Washlet is the perfect choice for the budget conscious. With its low price, energy saving mode and no need for a qualified installer, this model will save you money at every turn. The Brondell Inc. S1000-EW Swash 1000 Washlet comes in more than double the price of the S300, but with the multitude of extra features and improvements, it makes it worthwhile. Not to mention the money you will save annually on toilet paper. This model’s dual adjustable jet nozzles are made from stainless steel which provides the highest level of hygiene and durability. The nozzles self clean using Brondell’s silver nanotechnology. They won’t rust or discolour. The aerated wash sprays can be adjusted to three different width settings, different temperature and pressure settings, and there’s an option for an oscillating flow. The instant water heater means you will have constant hot water whenever you want it. The warm air dryer also includes a deodorizer to prevent any odours. The Brondell Inc. S1000-EW Swash 1000 Washlet is a good option for anyone who wants some added features in a neat design with more durable nozzles to prevent the need for repairs and replacements. The Toto Washlet S350e Elongated Bidet Toilet Seat uses ewater+ technology which is proven to provide a safe and effective cleanse. The pre mist feature prevents the bowl being stained, and the wand and bowl self clean after every use. The front and rear jets are adjustable to suit your needs and the tankless system guarantees constant hot water. The warm air dryer is also temperature adjustable. The remote touch pad lights up on use to make it easy to see, and the washlet even comes with a built in night light to produce a gentle glow. The touch pad has two memory settings, so you can pre-programme it to remember your preferences and not have to manually adjust it every time you use it. The Toto Washlet S350e Elongated Bidet Toilet Seat is ideal for anyone who values design and convenience over budget, as the sleek design is modern and clean looking and the pre-programmable settings saves a lot of time. The Toto Washlet S300e does everything the Toto Washlet S350e does. Plus, it has the added feature of an air deodorizer. This prevents any nasty lingering smells from escaping your toilet bowl, as the washlet releases the deodorizer as it cleanses you making for a pleasant, odour free experience. It also has an oscillating water feature and an energy saving feature. The washlet can predict the most common usage times and automatically switch into savings mode outside of these times, or it can be manually set by the user. For less than three dollars more than the S350e, it is a good investment to get the added features. The sleek design will blend seamlessly with your current décor and the elongated front of the washlet makes sitting on it a comfortable experience. The Toto Washlet S300e is an ideal model for anyone who wants a full range of useful features and also wants to save money and energy by having an energy saving mode. The BB-600E Bio Bidet Ultimate Electric Bidet Seat has dual jets for a back and feminine wash. The nozzles are adjustable and have settings options, include a kid’s setting which is particularly gentle. It has a wide nozzle with an oscillating flow and even has options for a massage mode and a bubble technology mode. The seat on this model is not only temperature adjustable, but is height adjustable too, meaning you can put it at the height that suits you for maximum comfort. This eco-friendly model not only reduces the need for toilet paper, but it also has an energy saving mode too. This can help the environment by not wasting energy and reducing the amount of toilet paper being expelled into the oceans. Not only is it eco-friendly, but the need for less toilet paper and less energy is also pocket friendly too. The BB-600E Bio Bidet Ultimate Electric Bidet Seat in an ideal choice for families with younger children due to the specially designed setting that’s just for kids! The Toto Sw502#01 Washlet is Toto’s newest washlet addition. The hidden cleaning nozzle extends at your command, putting forth a gentle stream of warm, aerated water. It can be set to gently sway back and forth and leave you feeling clean and fresh without the need for toilet paper. The nozzle self cleans before and after using it. The seat is elongated and heated to make your bathroom experience a one of comfort and cleanliness with complete ease. This model comes with the electric outlet attached. It is on the left hand side and is outward facing. This model falls in the middle of the price range and scored an impressive 4.5 star rating with Amazon customers. The Toto SW502#01 Washlet is ideal for anyone who wants a good all round washlet that delivers on its promises. It’s also ideal for anyone who already owns a Toto elongated bowl toilet as the washlet is designed to attach seamlessly and easily to these toilets. The Clean Sense dib-1500R Bidet Seat is one of the cheaper models we have selected, although you would never guess that was the case based on the large range of impressive features this washlet delivers. The features it boasts are adjustable nozzle position, seat warmer, seat sensor, user presets, energy saving mode, self diagnosis, easy to remove, install and clean, quiet motor, warm air dry including a deodorizer, child friendly settings and both pulse and massage settings. It even has an enema wash setting for a really deep clean. It has an option for a continuous flow of water, and the water is constantly warm. The seat warmer even has an indicator to warn you if the process isn’t complete, meaning there are no nasty surprises when you sit down! It really is an impressive model, and with seventy one percent of its Amazon reviews coming in at five stars, its users love it too! The Clean Sense dib-1500r Bidet Seat is perfect for anyone who is looking for a good all rounder that is good value for money. The Coco Bidet 9500R Elongated Toilet Seat is tankless, and can provide a constant, never ending flow of heated water so you never get a blast of cold water before its fully heated! The aluminium coated nozzle acts in three ways – as a standard jet nozzle, as an enema nozzle and as an LED night light to gently light your bathroom when using the washlet in the middle of the night. The seat is heated for your comfort, and after the cleansing process, you will be gently dried with warm air that includes a deodorizer to keep your bathroom odour free. This model comes with tow iodine water filters and has bubble wash, massage wash and pulse settings. A word of warning: This company doesn’t accept returns, so make certain this is the model you want before purchase. The Coco Bidet 9500R Elongated Toilet Seat is ideal for anyone looking for a reliable mid range washlet. The Brondell Inc. SW900-EW Swash 900 Washlet falls between the other two Brondell Inc. models we have selected in terms of pricing. This perfect mid range model offers all of the features you by now have come to expect from a Brondell Inc. model. The Swash 900 also features a quick release seat which makes cleaning easy and effortless. The lid has a gentle closing feature embedded in it, meaning there will be no accidental slamming of the lid and no trapped fingers if children are using the washlet. The Brondell Inc. SW900-EW Swash 900 Washlet is an ideal starter washlet for anyone who is looking for their first bidet seat and wants an easy to use, easy to maintain piece. The BB-1000R Bio Bidet Washlet is the higher end model offered by Bio Bidet. It encompasses all of the fantastic features mentioned in the BB-600E review, plus it comes with a programmable remote control to make your bathroom experience even more pleasurable. It’s ultra smart power saving function means it calculates the most used times of the day and saves power in between those times. It also automatically releases air deodorizer through the busier times, meaning there’s never any lingering odour when you come to use the bathroom. This rounded model is great for anyone with a rounded toilet bowl who needs to be space efficient. Complete with a full range of self diagnose technology, the BB-1000R Bio Bidet Washlet is the ideal washlet model for anyone who lives a busy lifestyle and wants the luxury and cleanliness that comes from a bidet, but doesn’t want to have to waste time manually programming it and changing settings constantly. The Smart Bidet SB-1000 Washlet has jets for the front and the back, each of which can be adjusted to five different positions. The water temperature has five different options and the water pressure has three options. After cleansing your skin, the warm air dryer will dry you to perfection, leaving no trace of dampness. The air jets have a choice of five temperature settings. The heated seat has three temperature settings and is fitted with a smart safety device which detects when you are present and only allows the seat to heat when you are seated. This model has an energy saving mode for the eco conscious and is easy to install. The combination of the super low price, energy saving mode and easy installation all add up to save you a lot of money, making the Smart Bidet SB-1000 Washlet the perfect choice for anyone on a tight budget. Choosing the best bidet toilet seat isn’t something that comes easy. With so many options available, it’s a big decision and the research alone can be so daunting that it can put you off and you end up buying a bidet toilet seat that isn’t right for you and family. Below are some things to consider when thinking about the right bidet toilet seat for you to ensure that you don’t end up falling into that trap! Of course you will still need to do your research, but by following these tips, you will have a more solid idea in mind of exactly what you are looking for which can make a real difference to the research process. For many families, their budget is always going to be a major consideration. Before you even start to think about which model to buy, work out exactly how much you want to spend. If your budget is $300, don’t look at the $600 range – it will only tempt you to over spend! Once you have your budget decided, you will be able to make an easier decision about features. List the features that you would ideally like your bidet toilet seat to have in order of their importance to you. You can now look for bidet toilet seats in your price range with your most important features. Brand can play an important role in your decision. Are you someone who only buys branded goods or are you happy to take a chance on a budget line to get more features for your dollar? Before you make a purchase, ensure that your bidet toilet seat is compatible with your toilet if they aren’t the same brand. Finding a design that fits your current bathroom décor is also something that can affect the decision. All of our top picks come in a clean, crisp white colour that will compliment any bathroom. However, if your bathroom features a strong signature look, then finding a bidet toilet seat that fits that look might be something you need to consider. If you are someone who cares about the environment and the affect you are having on it, bidet toilet seats can be a good way to reduce your consumption of toilet paper which is a definite plus. There are also models available with energy saving settings which can be another factor to think about. Overall, it’s important to choose a bidet toilet seat that suits you and your family. These aren’t usually impulse purchases as people want something that will last and not have to be changed regularly. They are quite an investment, and for that reason, it’s important that you choose the right one first time. A bidet toilet seat is the perfect solution to transform your toilet into a fully functioning bidet as well. This space and money saving solution brings you the best of both worlds without having to redesign your bathroom. We hope this guide has given you some inspiration about the best models available to buy.